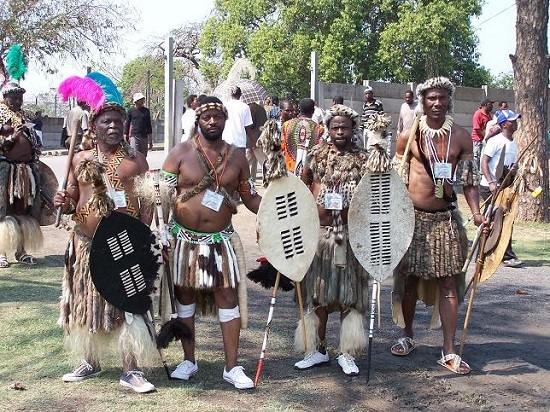 Every year on 24th September (SA national holiday Heritage Day) the Zulu nation gathers in a number of places to celebrate the life of King Shaka kaSenzagakhona, the founding father of the Zulu nation. 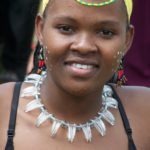 An illegitimate son of Prince Senzagakhona, Shaka inherited much of his leadership ability from his mother, Queen Nandi (see 48 below). A military genius, Shaka invented the “bull horn” formation which allowed his impis to surround and subdue far larger forces. 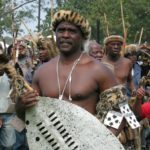 This, combined with strict military discipline – all Zulu men were compelled to undertake full-time military service until allowed to leave, sometimes after the age of 30 – meant that Shaka was able to defeat all surrounding tribes, all of which were immediately assimilated into the Zulu nation. 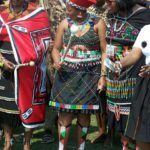 Shaka inherited the throne from his father in 1816 and in a mere 13 years created a nation that became the pre-eminent force in Southern Africa.